Old songs notwithstanding, we are not, strictly speaking, required to always hurt the ones we love—but as this issue’s stories demonstrate, things often work out that way. Ah, family! Consider siblings. In R. T. Lawton’s “The Chinese Box,” for instance, the city-bred and educated son of a Shan Army warlord finds himself in stiff competition with his own older half-brother, while two actors who once played brothers on a hit TV show have a very different off-screen dynamic in Brendan DuBois’s “The Wildest One.” Ecuadoran P.I. Wilson Salinas, meanwhile, must retrieve his neighbor’s granddaughter—snatched by her own father in Tom Larsen’s “En Agua Caliente.” A woman working a prison kitchen is tested when the man who killed her father demands that she help him escape in Janice Law’s “Good Girl.” And a family inheritance is at stake in our Mystery Classic, “Betrayed by a Buckle” by Louisa May Alcott, introduced by Marianne Wilski Strong. Once again, these stories show that blood will tell. Killers and thieves in our midst try to stay undetected, whether clinging to shadows or hiding in plain sight. The tales in this issue feature intrepid, if sometimes accidental, sleuths who uncover what’s hidden and unmask the villains in surprising and entertaining ways. 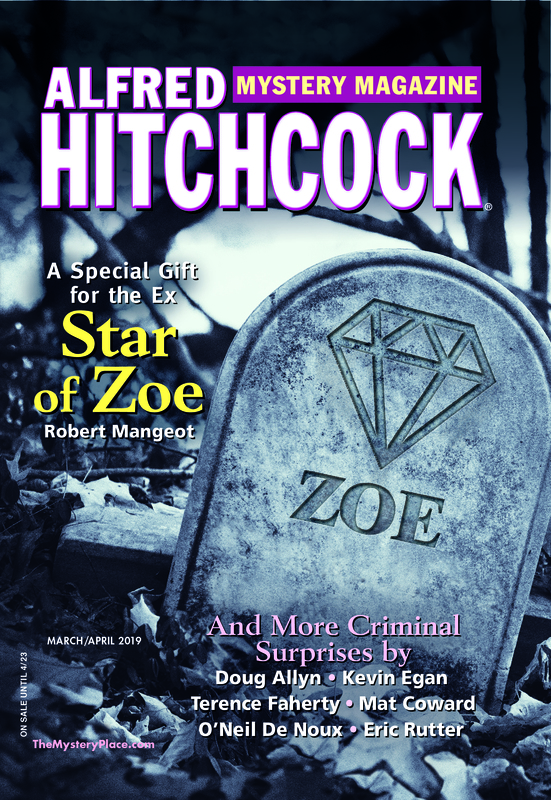 In addition to Robert C. Hahn’s book reviews in our Booked & Printed column, and Dying Words, a challenging acrostic by Arlene Fisher, this issue’s features include the debut of a new puzzle, Mixed-Up Sleuths, anagram fun for mystery mavens from Mark Lagasse. We also bring you a special Mystery Classic: Shelly Dickson Carr introduces a short story by her mother Julia McNiven, “Death at Devil’s Hole,” originally published in 1974. There’s always an extent to which crime is unexpected, except for the perpetrator—that is, if things go off as planned. It’s often the surprises, though, that make a great mystery story. Plus we have two great (only to be expected) procedurals from John H. Dirckx (“Go for the Juggler”) and David Edgerley Gates (“A Multitude of Sins”). Finally, this issue’s Mystery Classic is “Nebuchadnezzar” by Dorothy L. Sayers. The story was selected for us by B. K. Stevens, a life-long admirer of Sayers. Sadly B. K. Stevens died before she had a chance to write the introduction, though I know she chose it in part for its humor and because it’s one of the author’s lesser-known stories. As always, our tales may take some unexpected turns, but you can always expect to find great crime fiction in these pages.